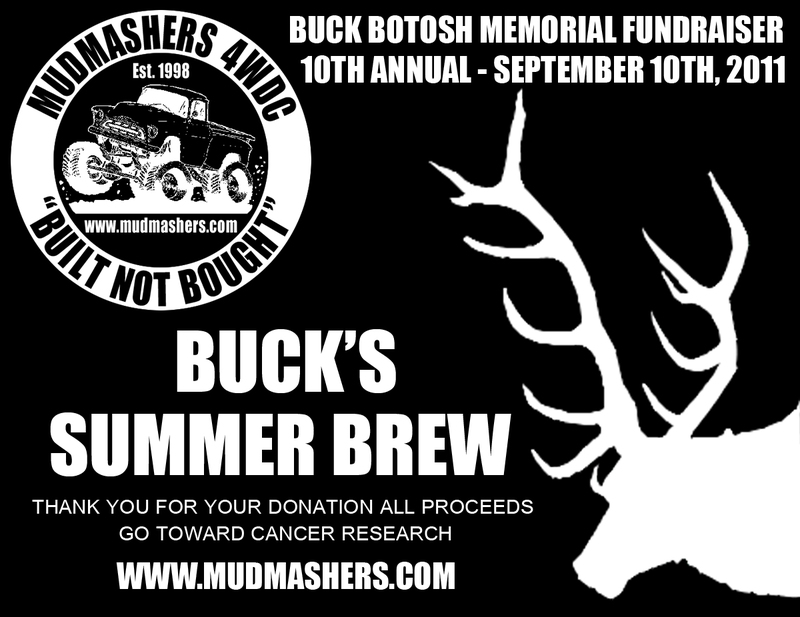 William "Buck" Botosh passed away from lymphoma cancer in 2001 at just 21 years old. 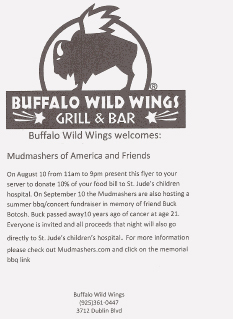 Every year since then, the Mudmashers have hosted a barbecue fundraiser in his honor, and this year's is expected to be bigger than ever. Born on June 8th, 1980 in San Leandro, CA to parents George and Brenda Botosh, Buck was raised in Livermore and Castro Valley along with his siblings, older sister Melissa, and younger brother Steven. He was a big part of many peoples' lives and helped start up the four-wheel drive club Mudmashers of America alongside his best friend Matt Marglon. Buck's hobbies included quarter midget racing, micro midget racing, 4-wheel drive trucks, country music, hunting, fishing and anything outdoors. Buck was a great friend, always there when anyone needed him and always willing to give the shirt off his back. As Buck's friends, we are trying to give extra support to the cancer community so young people like Buck can be cured of this devastating disease. It is our hope that one day we will only know of cancer because of the history books. 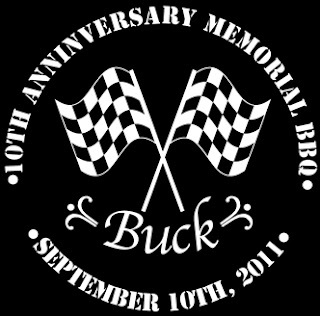 We hope you all can make it to Buck's Memorial BBQ. 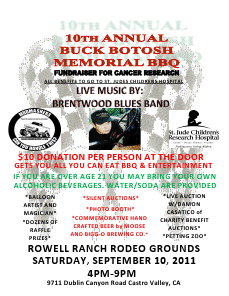 It's a fundraiser which all proceeds go towards St. Jude Children's Research Hospital. 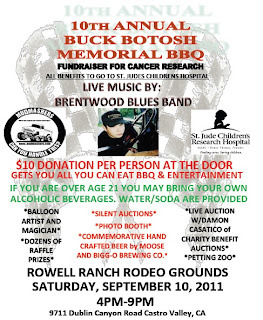 * Live Music by Brentwood Blues Band. * Live Auction w/ Damon Casatico of Charity Benefit Auctions. 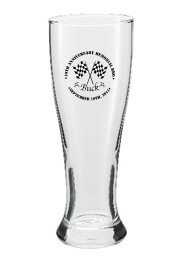 * Commemorative hand crafted beer by Moose and Bigg-O Brewing Co.
WE CAN ALWAYS USE HELP. 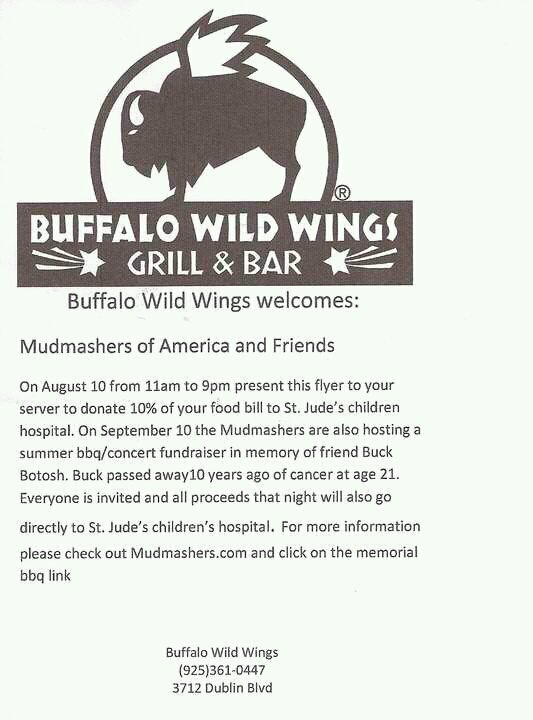 IF YOU'D LIKE TO BRING A DISH TO SHARE (FOR 20-25 PEOPLE) OR HAVE AN AUCTION OR RAFFLES ITEM YOU WOULD LIKE TO BRING PLEASE POST BELOW IN THE COMMENT SECTION. EVERY LITTLE BIT HELPS. BELOW IS THE PDF FILE IF YOU'D LIKE TO PRINT THE FLYER. THANKS. Click on the images below to view in google docs. Directly in the google docs window (not your browser window), click FILE ---> PRINT. You will also have the choice to save the file. 2) Rod Woodsen Autographed Football. 1) Authentic Autographed Derek Jeter Yankee Jersey.